Two German made twisted willow driving whips, made shortly after the war. These whips have a long tradition in Germany. A 4...5ft willow pole of 1in diameter is tapered and then split into four parts. A hand part of 8in is kept solid. After rounding and smoothing, the parts are steamed and twisted together. A keeper is put on with strong, waxed twine. 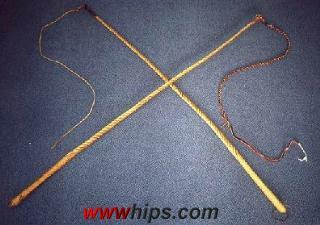 A single strand rawhide thong without popper is used for cracking. The right thong is 4 plt selfmade. Both whips are from the 1950s.